Our New York child went with cousins to one of the many soft-serve yogurt-add-your-own toppings places in Poughkeepsie this weekend. Florida child introduced her father and I to such establishments two years ago. We quickly learned that self-serve frozen yogurt in twelve flavors plus a choice of 33 toppings are not a friend of this compulsive foodie. The price you pay for this dessert is based on the weight of the serving. You extrude as much or as little as you want from the machine. Trust me, that stuff comes out fast. Even if it didn't, the containers are sized to encourage you to plop more into the bowl. These 'bowls' are two cup size. Then the toppings vary in weight and range from whole berries to cut fruits to gummie bears to cookie crumbles and sauce toppings. What if, instead of by the weight of the food, they based the price of your serving on the weight you are likely to gain by eating your portion? What if they based price on the calories in your bowl? It is never going to happen. Would it put these places out of business or would it help consumers better limit their portions and add-ons? I would have thought, nah. However, when I am in NYC, where restaurant chains are required to post their calorie listings, it helps me to make better choices and avoid some things all together and it has nothing to do with the price of the food. Can 'food taxes' work in the land of keeping the pounds off? I'm leery of taxes because of the politics. However I like labeling. Calories, salt, wheat, etc. I'm also in favor of labeling junk food "may cause obesity and diabetes, consume under your own risk. I know my health insurance premium will go up this year if I do not loose 1 BMI point, stay in the normal BMI or have a waist under 35 inches (40 for men). $30 more a month. Happily, I lost weight on my own and will save a boat load of money. 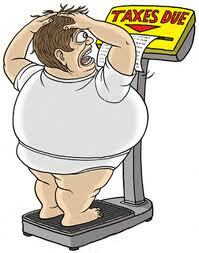 The rate of obesity and chronic related diseases will likely impact everyone, even at a normal weight. Yogurt add ins( and the yogurt itself ) was a huge downfall for me. Glad I don't eat that stuff anymore. I wish food taxes could help keep the pounds off. Particularly with the general American population...who is under a serious obesity epidemic. However, I know that people will just continue to fork out whatever it costs for whatever food it is that gets their rocks off. We live right near Philadelphia and there was SUCH an uproar when Mayor Nutter proposed the soft drink tax in an effort to curb the city's weight issue (Philly is a fat city...of course...cheesesteaks and soft pretzels abound here!). It would be nice, however, if people would really, really pay attention to calories when they eat out. I love what NYC has done...and I think that would work better to put a dent in the up-and-up obesity epidemic. When you see those numbers, you seriously DO stop and think. It's more effective than taxes. My two favorite yogurt places fill the cup for me (I choose small, medium or large) and one of them posts WW point for the serving sizes. I don't think taxes would help at all. I'm already bummed out that a lot of states are going to go ahead and tax the internet sales. Ugh. So only chains have to post the calories? How very arbitrary. Sorta like the idiotic 16 ounce or larger soda ban, but feel free to get a giant calorie laden mocha (NYC). I think it is rubbish. Hamburgers and fries are caloric, salad with non fat dressing, no cheese or croutons has very little. Shockeroo. It's all about education...the onus should be on the supplier of the food to honestly label the food it is selling. Health claims should not be allowed! If you have to make a health claim, it's probable that your food is not healthy! My point being that if food were honestly labeled and included appropriate warnings, education would happen! This is probably an unpopular opinion but when it comes to my health I will listen to someone who is healthy and living their life before I will listen to a doctor who is selling their soul to a product company. I will not listen to a doctor who has diabetes and still eats cookies, bread and pasta while worrying about controlling his sugar. (That was a hard doctor to switch from, because he is a friend). I listen to people who have left off hundreds of pounds without drugs and surgery. I listen to everything they say and I use what works even when it does not make sense to me at the time. Often their practices work for me, too. When they don't. I do not use them. I rarely listen to any corporate lines, professional salespeople or claims on labels. No one in my family is a corporate or product copywriter, lucky for me. i agree with you and at least 1 hour daily i did walk and jogging while i have to loose my weight 2 kg with in 20 days even now regularly i did walk and jogging. Thanks for great knowledge and you are deserve for it.